CUBE is driven by the aspiration to get out the maximum of every bike. Our brand epitomizes own ideas and developments. At the headquarters in Waldershof, Bavaria, our team of engineers continuously seeks to improve materials, constructions and processes. In our in-house test laboratory every model is put to comprehensive tests whose requirements are well above the European CE standards. Each and every carbon frame gets tested manually before further processing. Additionally, our bikes get tested by our engineers and professional bikers to avoid any mistakes and weaknesses. The result is an uncompromising combination of functionality, weight, stiffness and safety. We set new benchmarks, not only in the high-end segment – all our products profit from the best technology. The result is an uncompromising combination of functionality, weight, stiffness and safety. CUBE was founded in 1993 in Waldershof, Bavaria, by Marcus Puerner. 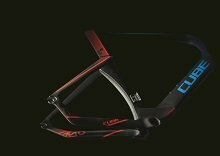 Over the years the company has become market leader in several European countries in the middle and premium mountain bike and road bike segment. The brand is available through specialist retailers in 60 countries worldwide. The current product portfolio consists of more than 180 different mountain-, road- , cross-, triathlon-, e- and trekking bikes. Ergonomically optimized bikes for women and kids as well as a clothing and accessories line complement the product range.